“As the famous Chicago saying goes: ‘If you don’t like the weather, wait five minutes. 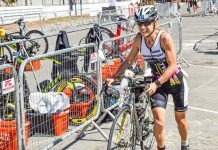 '” This could not have been more true than during the week leading into the Chicago Triathlon. 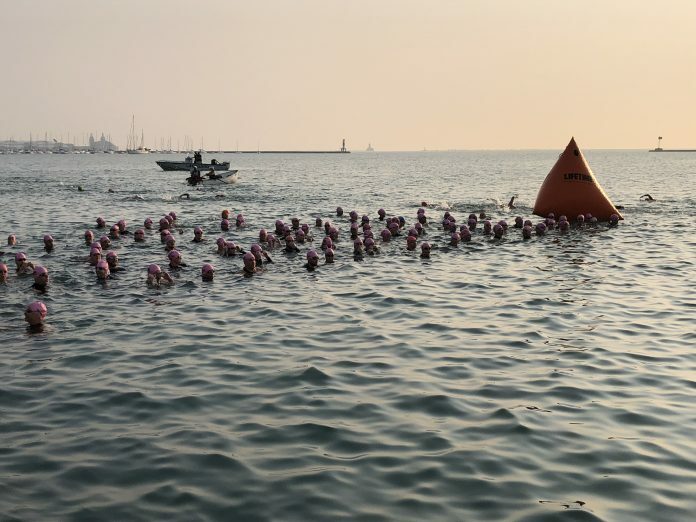 With a series of storms causing temperature fluctuations and dangerous Lake Michigan rip currents, no one knew what mother nature had in store for triathlon weekend, which annually attracts nearly 10,000 athletes across the Life Time Kids Tri Chicago, SuperSprint and the Transamerica Chicago Triathlon Sprint and International races. There is always an affable buzz of anticipation during packet pickup which was offered at multiple locations throughout the week and culminated at the historic Hilton Chicago with the Multisport and Fitness Expo. During the mandatory course talk we were told they expected the course warning level to go yellow and possibly red during the event due to expected heat indices in the upper 90’s. By race morning, when I arrived at 4:45 a.m. for transition setup, temperatures were already approaching 70 degrees. I waited as long as possible to put on my wetsuit before my 6:52 start time. When the horn sounded for my wave, water temps were around 70 degrees with very little chop. I usually struggle a bit during group starts, but I seeded myself surprisingly well amongst Wave 14 and did not need to rest during the swim which takes place in a well-guarded Monroe Harbor. There are support boats every hundred yards and lifeguards all along the wall amongst throngs of supportive family and friends. At the end of the swim, an awesome group of volunteers provide assistance out of the water and unzip your wetsuit before the 250-yard run to transition. After exiting transition, it was onto the southbound lanes of Lake Shore Drive which were completely closed to athletes for the first time. There was a pretty significant breeze during the ride, but it was difficult to judge which direction it was coming from. After 15 miles along the scenic Lake Michigan shoreline, it was time to dive under the city into the Wacker Drive tunnels before making our way onto the busway to the McCormick Place turn around. The bike route, while congested in a few locations, is one of the most attractive features of the race as the athletes get to see Chicago in a way that very few others do! Following transition two, it was fairly obvious the run along the lakeshore path was going to be a challenge. Whatever wind had blown during the ride had effectively stopped and the heat index had to be well over 90 degrees. It was extremely hard to find a rhythm in the heat and humidity. 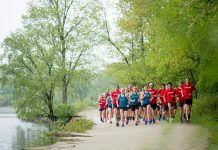 The segment of the race takes you down the lakefront path around the Shed Aquarium, past Soldier Field and into the natural prairie restoration project before turning around at 31st street to head back towards the finish in Grant Park. With eight aid stations on the International course, it would have been nice to have ice available before the last few. Around mile 4.5 we started to notice there were no athletes on the other side of the path and discovered they had started diverting everyone at the 5k turnaround because of the heat. This was an excellent decision as we had already seen some medical emergencies being attended to on course. 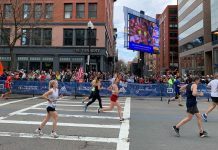 As pace began to slow, athletes started to have conversations to pull each other to the finish chute on S.Columbus Drive where the large crowd motivated us to the line and a live band and a wonderful recovery celebration (which included classic Bomb Pops) awaited us. Even with the heat, I managed a personal best by 7 minutes and 40 seconds.